This is the fifth in our series on "REDCOAT PROFILES"
This is how I looked in 1977. Please Sir! Can I have my hair back. It was the winter of 1975. Sitting in the cab of my brother Ronnie's truck, somewhere near Glasgow, I was reading the Daily Mirror ad's when I spotted "Redcoats Wanted for Summer Season." Although it had always been an ambition of mine, for a Brummie who had just bailed out of an apprenticeship to wander the country with his big brother in his HGV, the thought of actually becoming a famous Redcoat seemed a million miles away. Ronnie pushed me to apply with that well worn phrase "what have you got to lose?" The fact that my first ever holiday, at the age of five, was at Butlins Skegness, drove me on to give it a go. A letter arrived in January inviting me to an interview at a big hotel in the Birmingham city centre. I went along wearing flares, a red polo-neck sweater, and brown velvet jacket, feeling that I had more chance of making the Aston Villa first team (Yes! we were crap in the 70s too.] than getting the job as a Butlins Redcoat. I was called into the large interview room with an Ents. manager sat in each corner, and two others half-way down the room - all looking very important and surprisingly stern. North Wales." Dave appeared impressed that I knew my geography, and proceeded to throw loads of questions at me such as "Why do you want to be a Redcoat," to which I just answered as honest as I could in the hope that my personality would shine through enough to secure me the job. Come April, with no letter forthcoming from Butlins, I decided to join five of my mates on an adventure of a lifetime to live and work in Jersey. Within two weeks we were all skint and living rough on the outskirts of St. Helier in cardboard boxes, leaving our rucksacks in our boxes by day while we trawled the streets and building sites etc., unsuccessfully looking for work. Just as I was starting to consider straying into petty criminal activities, just to survive, I phoned home to try and convince my mum that I was fine and on my way to my first million when I was shocked by the news that a letter had arrived from Butlins saying they wanted me to start the second week in May - as a Redcoat!!! So after an emotional farewell to my mates, who accepted my decision to return to Blighty, it was a ferry then hitch-hike up to Brum to collect my stuff and then off to North Wales for a real adventure of a lifetime! On arrival at the gates my knees were knocking with excitement and the thoughts of "Oh well! if I don't cut the mustard, my box in Jersey will be there waiting for me!" Just putting on the red blazer and white trousers for the first time gave me a 'rush' similar to the one I experienced at the age of 15 whilst losing my virginity to a 21 year old German woman at a party in Brum. The night before the camp opened Dave Moore called a meeting in one of the ballroom, where we all were in full uniform just to make sure everything fitted and we looked the business. It was a chance to meet the other Reds and enjoy a drink afterwards. I think they call it 'bonding' nowadays? My chalet was grim, to say the least. I shared with Simon Hall, aka: Simon Sands, who later went onto make a good living as a comic. blimey where did 18 weeks go??? 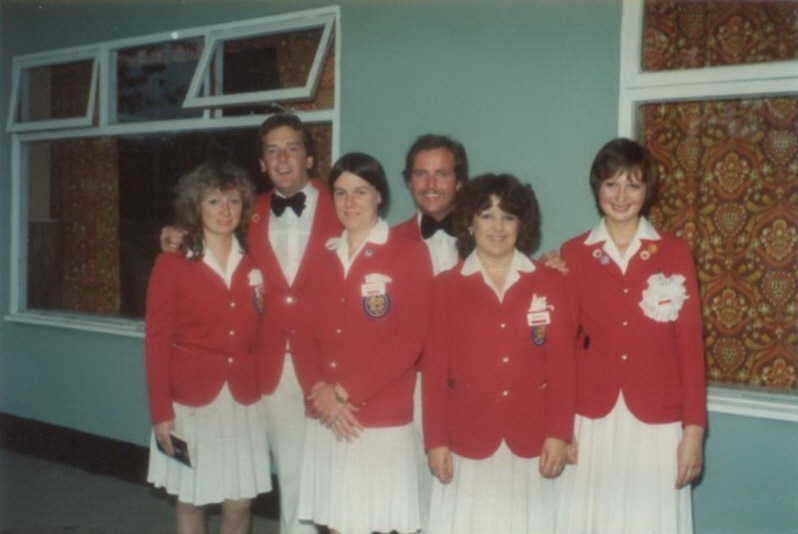 Signing autographs for hundreds of kids; appearing in shows with over a 1,000 campers in the audience; and enjoying the company of models - including Page-3 girls who came to Butlins to win the major competitions. For some unknown reason they thought getting to know a Redcoat might sway the judges decision - I certainly didn't tell them otherwise! In 1978 I went from Skegness to Pwllheli. Here's me with some of the gang. 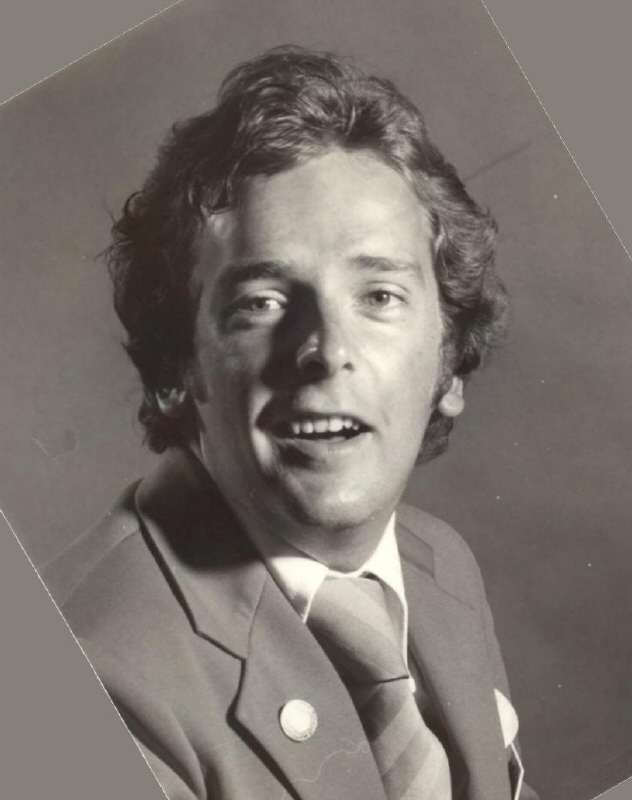 In 1980 I left Pwllheli to go to Skegness, where I remained as Camp Compere till 1985. Yes! it was a great time, and certainly the most entertaining 10 years of my life. I was able to secure work for several of my Brummie mates, who returned from Jersey to join me in various jobs at Butlins. One has just retired after 30 years! I met loads and loads of characters, including nutters; lovely genuine people; and girls that, to be honest, would not have given me a single glance in civvy street! 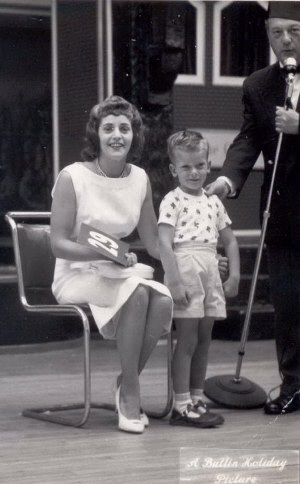 Later I got to work in Spain, Australia, and the USA, due to my Butlins experience. So, for anyone reading my little tale - don't hesitate - 'get in there.' I am not saying Butlins is the same as it was in the 70s and 80s, but surely it has to still be worth a shot. As for me now, well, I married a Redcoat from Skegness. We lasted 5 years before we went our separate ways. I am now settled back in Skegness with Tanya, my second wife, and our lad Herbie who is aged 14; and I am in my 24th year in a 'normal' job. But my memories of 5 years as a Red' and 5 years as compere, still put a smile on my face. go to bed with a coat hanger in your mouth!